Sett med 5 quiltelinjaler fra Amanda Murphy. Markeringer på linjalene gjør det enkelt quilte sirkler. Non-slip belegg under. Innsiden av sirklene gir deg sirkler fra 1/2" til 2 1/2" og yttersiden gir deg sirkler fra 3" til 7". Quiltelinjal, passer til mini curve linjalen fra Sew Kind og Wonderful. Her kan du quilte hjerter i 4 ulike størrelser. Designed by machine quilting author and teacher, Angela Walters, Archie is the perfect ruler for quilting arches in 3” borders or as an edge to edge machine quilting design. Whether you use a home sewing machine or a longarm, Archie is perfect for machine quilting: Symmetrical Arches Alternating Arcs Pointy Clamshells Elongated Orange Peels Continuous Curves and more! Features: - Creative Grids Grip to ensure the ruler doesn’t slip while quilting - Needle stop notches keeps your quilting continuous without effort - Reference lines in two colors, allowing you to machine quilt several different designs with ease and without marking! - Fits easily in your hand and is perfect for all machine quilters…from brand new to experienced. High grade, 1/4in thick acrylic. The serpentine line is a curvy design that’s perfect for quilt borders and sashings. 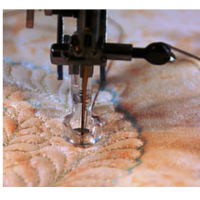 It adds beautiful texture and depth to your quilts, but can be difficult to free-motion quilt. Angela Walters, machine quilting teacher and author, designed Squiggy after the realization that this design was one that a majority of quilters struggle with. Squiggy is versatile, allowing you to quilt serpentine lines in 2in and 3in borders as well as quilting them from top to bottom, bottom to top, left to right or right to left. Now you don’t have to spend months trying to learn the design, you can get right to quilting them in your quilts! Features: - Creative Grids grip helps prevent your ruler from slipping. - Black and White dashed guide lines which are visible on all fabric colors. - Double sided to allow you to quilt multiple size borders with the same ruler - Seam guides helps keep your design straight. - Stopping points for a continuous quilting design. - High grade, 1/4in thick acrylic Use Squiggy for quilting: Serpentine lines in both directions in 2in and 3in borders and sashing. Overlapping serpentine lines Varied Serpentine lines Allover ribbons Ogees Clamshells and more!